The American Library’s Association’s Carnegie Medals were awarded to Donna Tartt, in fiction, for the novel “The Goldfinch”. I read this novel and enjoyed it. Doris Kearns Goodwin was given the award in the nonfiction category for “The Bully Pulpit”. The CILIP Carnegie and Kate Greenaway Medals were awarded. Kevin Brooks was awarded the CILIP Carnegie medal, and Jon Klassen won the Greenaway medal. Dinner with Lenny: The Last Long Interview with Leonard Bernstein, by Jonathan Cott, is a book I could not put down and read straight through. In fact, I read it a second time. Leonard Bernstein’s words are profound, as was his life and career as a renowned composer, conductor, pianist and so much more. There is a little known fact: Bernstein was an activist for humanity, and always tried to instill humanistic values within his life and the lives of others. He was an educator, not only concerning music, but concerning the rights and lives of individuals who were repressed. The interview is amazing in scope, spanning the life of Bernstein, spanning his many accomplishments, and spanning his ideals and ideas, from politics to pop music, to rock and roll. His outlook on religion is encompassed within the pages, as are some of the personal facets of his life. Jonathan Cott has given the reader much to ponder regarding one of the greatest musical figures of the twentieth century. Leonard Bernstein’s words reflect honesty, humor, integrity, love of life and love of mankind. He was an amazing musician, but more importantly, an amazing person, whose kindness and fight for the rights of others will live on through the generations, not only through his music, but his humanitarian actions. 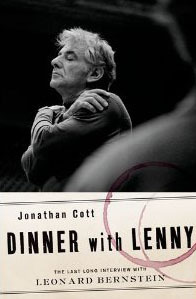 I highly recommend Dinner with Lenny, by Jonathan Cott. The Train to Warsaw: A Novel, by Gwen Edelman, is an interesting work of historical fiction, based on two characters’ impressions of the city on a postwar return trip. Jascha and Lilka have returned to Warsaw after having escaped the Warsaw Ghetto and the atrocities and horrors of World War II. They left individually but managed to reunite years later, after the war. Jascha is a writer and has been invited to give a reading in Warsaw, forty years after escaping. He is reluctant to go, because deep in his heart he knows that the city is not the same, and that nothing could ever replace what once was. Lilka, on the other hand, wants to return, wants to put to rest the memories of what occurred, and the positive memories she has of a city that once was. She feels that it will be a cathartic experience and encourages Jascha to attend. He finally gives in, and so their journey begins, back to the country the left, and back to memories, both stifled and constant. The dialogue in the book is written without quotation marks, which made it difficult to realize who was speaking, at times. I found myself having to go back and reread some of the dialogue to ascertain who was the one talking. This made it a more difficult read than necessary. Their journey through Warsaw, through streets once walked, paths, sights and buildings once so familiar, AND through the area that was the Warsaw Ghetto, became very arduous for them due to the changes that have occurred. The changes of time have purposely been erased. Lilka has difficulty dealing with that, whereas Jascha knew, beforehand, what to more or less expect. He was cognizant of the reality. Within that concept, the book depicts the individuals that Jascha and Lilka encounter with an indifference in regards to the past. Those individuals either do not want to remember the past, or are too young too remember it, or were born a decade or two after the war and do not know the true history behind it. The city’s inhabitants are trying to move forward without taking their history with them. They want to leave the emotional suitcases and other baggage behind. I felt the book was a bit drab, and that the characters were not evoking positivity. Of course, Jascha didn’t want to be there to begin with, and Lilka’s concepts keep referring to “what once was”, and she couldn’t let go of those perceptions. She was in shock seeing things for what they currently were. The novel takes place on a train, in a hotel room and in the city, itself. With each passing moment, the discussions revolve around the past. Enfolded in those discussions are secrets from the past, that slowly come to be revealed, by both of them. I did not really like the characters, but then again, one can read a book and still find fruit in it, despite not liking the main characters. I did understand the pain that was depicted throughout the pages, yet it wasn’t enough to satisfy me. In my opinion, it was okay. I would rate The Train to Warsaw a 3 on a scale of 1-5. Simon’s Family, by Marianne Fredriksson leaves us to ponder what defines family. This was a well-written novel on the aspects of what it means to be a family. Families come in many forms, such as, biological, extended family, imaginative families, and those we choose to be part of our family. Extended families play an important role in Simon’s life. Simon Larsson and Isak Lentov are eleven years old friends. Isak is Jewish, and from a wealthy home, and when Simon visits Isak, he begins to see the differences in their life styles. When Isak visits Simon, he finds a family surrounded with love and caring. Each one comes to discover their differences, their similarities, and their uniqueness, within familial confines. The story takes place during the pre-World War II period continuing through the war. This exceptionally insightful story deals with mothers and sons, three generations of women, and how they affect their sons, both emotionally and physically. T he book also sends a strong message on how we assimilate into society, the way we choose to fit in. Issues of stability and fear are detailed, as if we are within the bodies feelings the emotions of the book’s characters. The word-imagery is vivid. The book grapples with how fear plays a major factor in some lives, and how it can imprison us, if we let it. Familial roles are played out, by relatives, friends and others…with the children always at the end of the rope, as a tug-of-war progresses and continues. The novel is a metaphor for the relationships between mothers and sons, and is exquisitely written, with beautiful depictions. I would recommend Simon’s Family, by Marianne Fredriksson to everyone who is interested in societal structure and cultural boundaries, and those interested in the difference and sameness, within all of us. It is a Jewel of a book! “Skeletons at the Feast“, by Chris Bohjalian is based on a Prussian diary, and is an intense novel, filled with historical fact, within the pages of fiction. It is a poignant, harsh, realistic, descriptive, and an inspirational novel, depicting the last year of World War II, as seen from varying unique perspectives of those who are trying to flee the Germans, and also flee the Russians, and whose lives come to relate on some level. It isn’t your typical World War II novel, strictly filled with atrocities of the Holocaust, but a book that focuses on Jews, on German citizens and Prussian refugees, and how they try to survive before the Russians take over, and how the war affected them. The characters appear as different as night and day, yet they have the same goal, to escape their current circumstances. We have a German Jew who managed to escape deportation to a concentration camp by throwing himself off of the train that was taking deportees there, and is now disguised as an SS officer; a Prussian aristocratic family who is holding a Scottish Prisoner of War (POW), and two women inside a concentration camp who are witnessing horrific atrocities. The various characters eventually blend together in their transitions and journeys to avoid the Russians and/or Germans, and no matter how minute, they do manage to relate to each other, as each one is a piece of the whole in the weaving of the tapestry. Anna is one of the main characters, and she falls in love with the Scottish POW. We see how she begins to view things, slowly, in new perspectives, and her image of Hitler changes, and we see how Callum, the Scottish POW views the war from an allied view point, and from that of a POW. Anna’s mother admires Hitler immensely, meanwhile her father and two brothers, are ordered into the German Army. Bohjalian manages to bring insight to mother and daughter, as they begin to grasp the intensity and reality of what is happening, as they cross paths with labor camp victims, as their expectations and visions are diminished with realizations they don’t want to face. There is Uri the Jew, trying to survive within the confines of Nazi Germany, yet he manages to help, and save, some Germans along the way. Lives intertwine, compassion illuminates within the diversity and confines of war, and some of the characters are left wondering how they believed what they did, how could they not see what was happening, why didn’t they see the realities? So many questions are asked, but there is no clear answer, and they feel the burden of guilt begin to weigh on them. What is right, what is wrong, the lines are blurred. Denial played a big role during World War II, and many could not fathom and believe all that they were hearing, or they were in denial and didn’t want to comprehend that the Nazis could be committing all of the murders, atrocities and exterminations that the radio news and grapevine stories stated were occurring. Their Germany was civilized and filled with arts and culture, their Germany would never stoop to the tactics they were hearing about. Their Germany was about to fall, and they slowly began to understand the severity of the situation. I don’t want to go into the depth of the story line , as I feel you need to read “Skeletons at the Feast” for yourself in order to understand the intensity of the situation thrust upon the characters. They were the defeated, the vanquished, striving for survival, unable to handle their circumstance in an organized manner, as they fled westward. Bohjalian has a deep sense of time and place, and an strong insight into the historical events that took place during World War II. From the atrocities of the Holocaust, to the Russian occupation about to unfold, he brings us a story of people on the edge of life, people fleeing, fleeing in fear, frenzied, in denial, not able to grasp the complexities of their circumstances, people similar to those I read about in Irene Nemirovsky’s masterpiece of a novel, “Suite Francaise“, French people in a panic, not knowing who to trust, where to turn, where to run, how to act, how to flee. Bohjalian manages to encapsulate all of that and so much more into his masterful writing. Bohjalian has brought us a novel on a grand historical scale, in “Skeletons at the Feast“. He is brilliant with his word visuals, and our senses are heightened throughout each page. The novel is riveting, intriguing, compelling, brutal and harsh, yet there are the moments of love, humanity and inspiration, and the moments of clarity, within the disbelief, for the characters. There were times when certain things were beyond their control, and when survival becomes a prime force in their actions. Some might differ with this opinion, and to be sure, I am certain there are those who will disagree. But, for me, the message was extremely clear, and the metaphor was strong and illuminating…how war affects everyone…no matter who they are…and how man’s humanity and kindness can survive under adverse conditions…through all the horrors set before him…and how humankind can react with acts of kindness purely for the sake of helping another, selflessly, no matter their race or religion, and no matter if they give their life up for another. Redemption and illumination, love and war, violence and compassion, time and place, are all a part of the epic tapestry. One must read each line carefully, and take in each word with thoughtfulness, pondering the circumstances in the lives before them on the pages, as the war affects everyone involved. Once a person has done that, they will then begin to understand the depths to which Chris Bohjalian has written a magnificent and historical novel, and an extremely incredible and overwhelming story in “Skeletons at the Feast“. His message is timeless, and could apply to certain circumstances occurring in the world, currently. This is my second reading of this gripping novel. I read it two years ago, and have just now finished reading it, again, for a book club discussion. The Boy Who Loved Anne Frank: A Novel, by Ellen Feldman, is an interesting novel of the Holocaust written from a unique perspective. It is a poignant and compelling story line, which includes haunting remnants of the first love between Anne Frank and Peter van Pels. The historical novel kept me captured through the last page. Feldman details the historical, and little known facts regarding the diary of Anne Frank. She gives the audience a perspective of, “what if”. What if Peter had survived? What would his life have been like if he had survived? The flow of the story shows how the boy, Peter, grew into an adult. Feldman is extremely brilliant and descriptive in detailing his journey from child to man. There are emotional illuminations, expanding on how he developed into a man who came to hate himself, through his own guilt, denial, assimilation, new identity, and fear. The Boy Who Loved Anne Frank leaves one to wonder whether promises made as a teenager should be kept as we grow and mature. The author analyzes that factor and how it plays into Peter’s life. The analogies in the novel are extremely compelling, the fear often causing a Holocaust of Self, so to speak. Peter’s attempt to forget his past, and start anew after emigrating to America, only dig him deeper into the roots he tries to blot out. He marries, has children, yet he vividly cultivates memories of his past through flashbacks, and entwines them in his mind. Some memories are real and ome are imagined. All are after-effects of the Holocaust. We watch him deteriorate before our eyes, and can envision his actions through Feldman’s masterful word imagery…such as when he discovers Anne Frank’s Diary has been published. The events that follow that discovery are a study on the fear Holocaust victims carried with them…hiding, moving, whispering, running. The book became his stepping stone backwards, forwards, and backwards again into fear and loathing. I was intrigued by the information contained in this amazing historical novel. There are scenarios regarding the events leading to the lawsuit filed against Otto Frank, disputing some of the facts that were permitted to be given creative license in the play and film. I recommend The Boy Who Loved Anne Frank. The effort put forth by the Ellen Feldman is one that you will not soon forget. Her writing is brilliant, cutting to the core of emotions and logic. The book is infused with incredible word-paintings, and historical relevancy, leaving the reader with much to ponder. © Copyright 2007 – 2014 All Rights Reserved – No permission is given or allowed to reuse my photography, book reviews, writings, or my poetry in any form/format without my express written consent/permission. 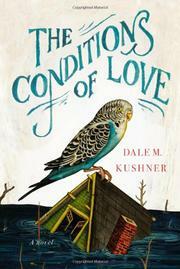 The Conditions of Love, by Dale M. Kushner, is well-told story regarding love in all of its facets. Eunice is the main character, and has her journey set out for her amidst a flurry of emotions, personalities and individuals, during the late 1950s through the 1960s. The characters that Eunice becomes involved with have their flaws, and Kushner depicts these individuals quite capably. Flaws do not necessarily mean negativity, but rather a step in the journey of lessons learned and a path towards maturity. They can bring insight into developing mindsets. We are human, and are all flawed in some manner. Her father left the family, and she has been raised by her mother, Mern, a woman who idolizes the glory of stardom and beautiful clothes, and runs from one man to the next specifically a new boyfriend, named Sam. He tries to be a caring individual, but she will not have him as a father figure. She craves her biological father. Eunice has not separated from her biological father, emotionally, and constantly dreams of him returning to the family. She has imaginary conversations with him and he becomes the idol of her imagination and of her life. When he does make an appearance it is not what she expected. She is left with having to decide where her loyalty lies, one man over the other. She is too young and immature to understand the true concept of love, that you can love more than one person as a father figure or dominant life force. Her life moves from her mother to a caretaker type of person named Rose, to a boyfriend named Fox. The various individuals in Eunice’s life offer her a sense of security through their love for her. She doesn’t always see it that way. Maturity and insight normally require an understanding and sense of Self, and the hindsight of previous paths taken, whether unsuccessfully or not. The title implies that love requires conditions, in the sense of love being a conditional entity (one person requiring another to act a certain way, or do a specific thing in order to gain the love of the one requiring the action/s). It also implies an undertone of loyalty. But, if the reader looks at the title and its meaning in a different light, a more reflective one, then he or she can see that unconditional love also requires a condition or two. Of course, the condition/s are not the same as the ones regarding conditional love. Unconditional love implies just that…the love of one for another is not based on actions, but is based on love for another without any condition attached to it. The condition that is not necessary is the fact that nothing is required of the one who loves another, unconditionally. That requires extraordinary control. It also requires the knowledge that love is not something that can be removed so readily or replaced so easily. You can not replace one love with another. It just doesn’t work that way, in reality. Eunice takes the long road for her journey, and moves through people and their love for her in an almost indifferent manner, at times. She is quick to resist love that has been showered on her, unconditionally. Loyalties get in the way. From childhood to young adulthood, Eunice is thrown into situations that are in conflict with each other. Love of the natural order of things, such as land and nature conflict with love for the superficiality of movie stars and stardom, clothes, and things that do not realistically define the underlying Being of a person. The Conditions of Love is almost an existential telling of a young girl’s coming of age. Dale M. Kushner understands this, and writes with flowing prose and lovely word-images to bring the reader a subject that each person can identify with. Love, in all of its glory is a complicated issue, and not something to be taken lightly. I enjoyed watching Eunice grow, emotionally, into the woman she became. The Conditions of Love, by Dale Kushner is a book I recommend.